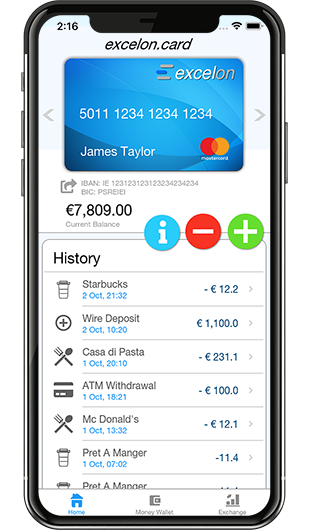 Running on Android and iOS, the Excelon App is always with you to help you manage your financials and spending. All App features are available in the mobile version so you will never need a PC to access you account. Order, Topup and manage your Cards so you always know what you spend. Execute payments through wire transfers instantly. We have developed a powefull solution to help you in all the aspects of your personal banking with ease, security and competitive fees. You can withdraw Cash at more than 2.1 million ATM locations worldwide displaying the Mastercard® Acceptance Mark. Freelancer? Traveller? Student? Ex-Pat? Shopper? Excelon is here for all of you and even more! Use your Excelon Prepaid Mastercard® in at over 36.9 million locations worldwide displaying the Mastercard® Acceptance Mark and on the Internet and buy goods without paying any fee! Get an IBAN Account with each Excelon Prepaid Mastercard® to receive and pay money to anyone globally. Topup with Wire Transfer, Debit and E-Money Voucher instantly. 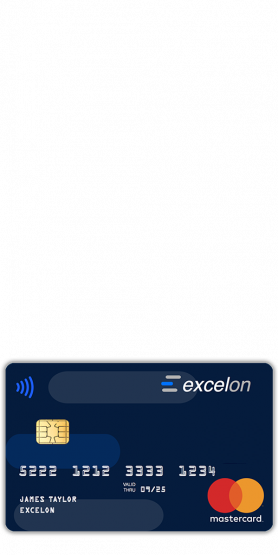 Manage your spending with the Excelon App. 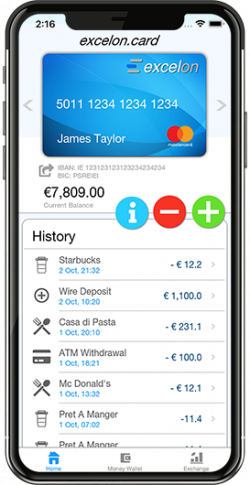 Receive notifications and reports on all your transactions so you are always informed. More secure and convenient than either cash or cheques.